Christian commentators have pointed to the contradictions of the modern world, and they have asserted that the answers to these contradictions can be found in Christianity. “The Bible has the answers,” Christians tell their friends, their children, and themselves. Yet whenever pastors or Christian instructors confront the congregations (or each other) with concrete requirements of biblical law, the instant response in that “the churches shouldn’t meddle in things that don’t concern them,” meaning politics, economics, or anything else that might prove controversial, or even worse, disruptive of prevailing ecclesiastical, academic, or business practices. The Bible has the answers for every problem, but these are supposed to remain vague generalities except when in accord with the accepted cultural heritage of the denomination or congregation in question. Things are not much better on campuses of Christian colleges. Very few instructors ever attempt to fuse the teachings of Scripture with their academic disciplines, requiring the methodology, facts, and presuppositions of their discipline to be conformed or reformed according to biblical revelation. Hence, a kind of intellectual schizophrenia exists on every Christian campus. Secular textbooks are baptized with a morning prayer or daily-required chapel. Here and there we do find faculties that do contain a few members who see the need for Christian reconstruction in every branch of the college curriculum. 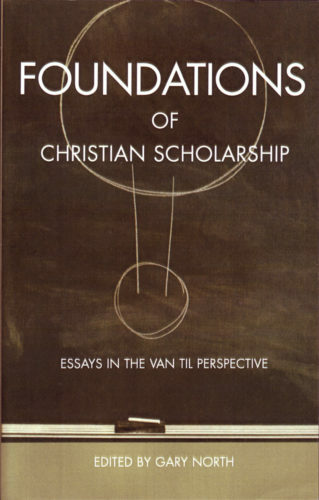 The essays in this volume represent a beginning. Too many academic disciplines are absent from its pages, but at least a preliminary start has been made. The writers are committed to the interpretive principle of biblical a priorism: the Bible judges both the framework and the content of each academic discipline. Either the Bible is the final standard for all human thought or else the logic of the self-appointed autonomous mind of man. The mind of man is not autonomous; it is derivative, created, and ethically fallen. It now labors under the curse of god. It is not the standard of truth in any region of the universe. Hence, men must bring their speculations back into subjection to the revelation of God. If education is to be seriously, consistently Christian, an intellectual reformation is required. It will be resisted more forcefully by those within the camp of the faithful who believe that intellectual schizophrenia, if baptized early enough, is the hallmark of mental health. Judgment begins at the house of the Lord. So does reconstruction. Dr. Gary North served as the editor of the Journal of Christian Reconstruction from 1974-81. He is the noted author of scores of articles and over thirty books on economics and history. Currently he serves as editor for GaryNorth.com and The Tea Party Economist. He is the Director of Curriculum Development for the Ron Paul Curriculum.